There’s a reason Google is working at a rapid pace to bring location services to the forefront of many of its products (Maps, Search, Latitude, etc) — new potential business models. Sure, location also happens to be useful to many consumers, and that’s undoubtedly why Google loves it even more. Like AdSense, it’s a mixing of what’s potentially useful for a consumer, with a way to make money. So what exactly are they going to do with it? Well, location-targeted ads are already out there, but will get much more refined. But there’s also potential for new ways to use location as a business model. And the startup Foursquare is already showing the early stages of what could be some very interesting things. A couple months back, we wrote about localities in New York and Los Angeles using Foursquare “mayorships” (which you get when you check into a venue the most times compared to others in the city) as a way to give out special deals, like free beer. That idea continues to expand. As Amit Gupta noted yesterday, a bar/performance space is doing something similar in San Francisco. But they’re also expanding on the idea. Not only does the mayor of the venue (The Marsh) get free drinks, but everyone who checks into the venue on Foursquare and shows proof (on your iPhone or other mobile device) gets $2 off a ticket to any performance that night. 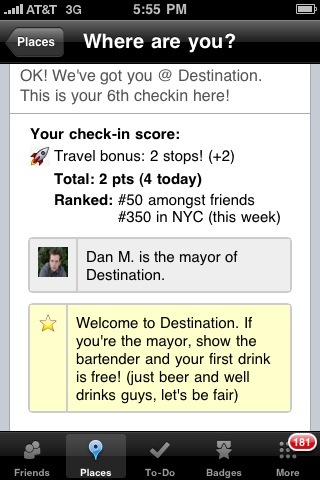 While Foursquare didn’t officially sanction this, it loves ideas like this. 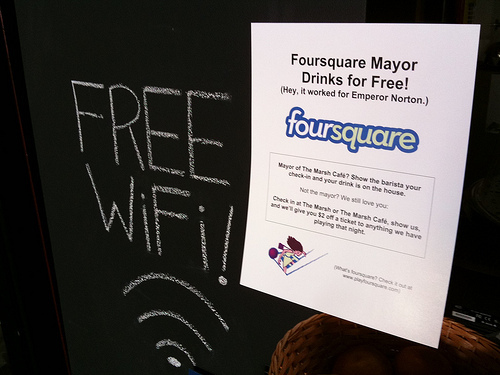 And it should be obvious why: It entices people not only to go to those venues, but to use Foursquare when they do. The service loves the idea so much, that it’s building support for these types of deals, or “Mayor Bonuses” as they it calls them, into the next version of the iPhone app. It’s still being worked on, but in version 1.4 of the iPhone app, “ideally, when people checkin into places that have some kind of special / offer / etc, we’ll show a banner at the bottom which you tap to slide over and see the promo info. If the promo requires some certain level of “local” (e.g. you’re currently the mayor / you’ve been here 10x / etc) then you’ll see a special screen that you can show to bartender / waitress etc that makes it easier to identify that you’re entitled to the freebee,” co-founder Dennis Crowley tells us. It may look something like the image on the right, though that’s just something they threw together quickly, Crowley says. Amongst the people who use it in San Francisco on a regular basis, I know that will go over very well, and should cause a rush to certain establishments on certain nights. The next step would be Foursquare striking some kind of deals with these places (since it would be driving paying customers to them), and voila, you have a nice little revenue model. That’s when I realized how valuable Foursquare really is from a business perspective. Mike made a recommendation to me, but Foursquare was the service that actually knew that I went, because I checked in. Being able to connect web advertising, recommendations, and social media buzz to an actual person walking into your store has long been the holy grail of the advertising world. We spent lots of money and effort online to drum up our brand, but does it actually drive food traffic? Foursquare knows. Plenty of others (including Google) are working on similar ideas surrounding location-based coupons, but the Foursquare idea has different potential because it’s a more proactive use of location-based services. On one level, Foursquare is more of a game, and some people use it to obtain a high score and get badges (for checking in certain places). That’s different from being in a place like a grocery store because you’re shopping as you normally would, and seeing a coupon pop up. And the badge aspect contains more possibility for the service. I’ve had a number of conversations with people in the advertising space who think that sponsored badges which center around events (like SXSW, where the Foursquare iPhone app officially launched) has real potential. Know of any other establishments offering deals to Foursquare users? Foursquare is requesting you let them know (more here). And also let me know, so I can go to them and get free drinks.